In my speaker shopping, which continues, the reviews of the GedLee speakers, available as completed speakers or in kit form, and designed by Dr. Earl Geddes, have intrigued me. I want to thank the other users of this forum who wrote about these long before I found out. 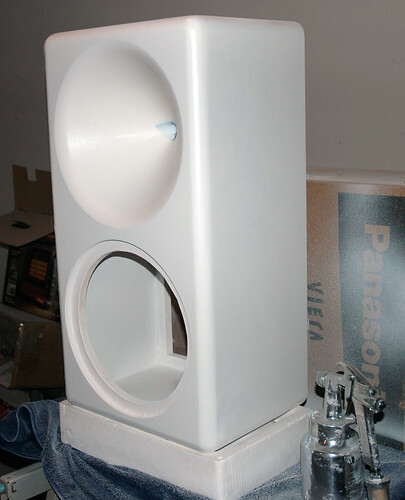 These speakers use Pro drivers and a waveguide. They are said to be very dynamic, with the ability to play very loud and very clean. Designed with HT in mind. I've e-mailed Dr. Geddes about this thread, and he has agreed to answer questions about his products here. I'm also hoping some owners of either the GedLee Summa, Nathan, or Abbey speakers will join in and write about their experiences. The first photo below is from the GedLee web site, the second is a picture of a customer built kit.
" ... To make it short: the speakers are awesome. If you've never listened to a speaker that is capable of reproducing such a wide dynamic range without distortion (take any of the popular 2 way boxes) then you'll be amazed how lifelike e.g. a voice can be. The lack of compression combined with a high directivity that minimizes disturbing reflections helps in raising intelligibility not only of voices but of the whole sound stage. Normally you would have to install absorbers matching the directivity of the speaker to reach that level of intelligibility. Furthermore the directivity is very constant so coloration from the indirect soundfield is minimized. In spite of that I've installed absorbers behind the speakers because even a 15" woofer isn't capable of following the directivity of the horn down to the lowest frequencies. All in all this speaker is very analytic and let's you really hear what's on a recording and what stereophony is capable of. Sometimes it hurts with bad recordings but most of the time it's just a big joy. With all that said keep in mind that the Nathan is "only" a satellite speaker that needs to be complemented with one or more subwoofers. If you're looking for a stand-alone speaker then the Abbey or Summa maybe right for you. ..."
I would be happy to answer any questions regarding these speakers. There are far more reviews on my web site and other sites on audio. If you are not aware of whats happening with waveguides recently you shoud be. They will change everything. Well I have written up my own experience in building and evaluating the Abbey kit from Dr. Geddes. Here is a picture of these speakers in a temporary setup. My plan when moving to this speaker was to change to an acoustically transparent screen. Current room setup prohibits moving things around for the center, for now, so just know, I know its poorly setup, it will change in the future. Processor: Boston Acoustics AVP7 Pre-Pro modified with LM4562 opamps and panasonic FC caps (received all as free samples) or surplus stock. Amplifiers: Acurus A200, DIY based on AussieAmps modules LSP-400's and NX-150s (My own CLC power supply design similar to Cello amps). Sources: PS3, Oppo DV983H, Toshiba HD-A35 and HD-A1, Acoustic Solid Turntable, Musical Fidelty X-LP heavily modified. Screen: 100" 16:9 motorized retractable with surface painted with gray high contrast paint mixed with metal powder and retro-reflective beads (soon to change). Speakers: Jm Labs Electra 905's, Matching Electra Center, Diy M&K Tripole Clone using surplus cabinets and tweeters, DIY Subwoofers (Currently 2, but mains speakers are now run full range), DIY Focal speakers, DIY Dynaudio speakers, and now Gedlee Summa Abbey. Well let me first say that after listening to a lot of different speakers in my own system over the years, going to lots of different theaters, hearing lots of different professionally installed theaters, the one thing I found was that very few could reproduce the scale of movies or music. Often it was difficult to know when rock recordings, but live acoustic recordings of jazz and classical, especially things I was familiar with live, were simply incorrectly scaled by most all speakers I had heard. While I think there are a lot of things which contribute to realistically reproducing a performance, one of the major ones that most speakers seemed incapable of doing was live performance levels and dynamic range. I think this is even more important in movies, as the dynamic range really needs to go from ambient noise floor levels to full on explosions. However I recently noted some research stating that the dynamic range of musical performances is much greater than previously stated (25-45db's was the old view, some now argue it's more than 60). While I have no delusions of reproducing 60 db's of dynamic range, I wanted at least 25db's with no driver compression distortions over a very wide frequency range. This means that I need a speaker that goes from my noise floor to at least 25db's. If my noise floor is 65db's, then I want 90db's with zero compression. What I really was hoping for though was more realistic ranges, like 40db's, and realizing that my noise floor often is closer to 70db's, that meant peak output in the 110db range. My experience has been that no speaker I have heard can cleanly reproduce 110db's with suitably low driver compression over a very wide frequency range. Dr. Geddes seems to share my view that few if any speakers made could handle realistic dynamic range, and those that could, sounded bad in other ways. I still wanted a disappearing act from the speakers for staging, with accurate size, scale, and placement. I wanted natural tonal balance, no horn honk, no perceptible coloration's, etc. There are speakers that can do some of these things, maybe even some that can do all of these things, but none I can afford. Then add in the room acoustics issue, and value in controlled directivity over a very wide range, and I believe there really are almost no speakers on the market that fit the bill. JBL and Klipsch have speakers that I feel fit the bill in some ways, but the ones that didn't sound overly colored were too expensive, and really still weren't exactly what I wanted. Did the Abbey's fully fit the bill? I think so, I've not lived with these as long as other speakers, but they do things no other speaker I have heard can do. They do seem to produce a convincing sounstage of accurate size, scale, placement, etc. The speakers mostly seem to disappear, but I also have a compromised placement with lots of diffracting objects around the speakers. They don't sound colored to me at all, and my frequency response measurements do indicate a smooth relatively flat response in room. They don't sound like typical waveguide or horn loaded speakers, a big fear I had. They play very loud with no audible compression at any level I should be listening at. In fact, I find myself listening at louder levels than I normally do because for the first time, I can listen to movies and music and not be irritated by distortions caused by overloading drivers. Oh yeah, for acoustic treatment I use panels I bought from ATC on the front wall behind the speakers, and a few more panels I made in a few other locations where I had strange reflections. I have diffusers I made on the rear wall, but plan on adding more and maybe better diffusers. I have no bass traps at the moment because the ones I tried had no appreciable or even measurable effect on my bass performance (The Geddes or Harmon approach to subwoofer setup is much more effective). I do plan on building some tuned traps when I have time. pjpoes, I've followed your build thread; it's great reading that richly describes the experience of working in a barely heated garage on a labor of love. I have a question I've asked others; do you have to EQ these speakers, or would they be fine with my two channel, no tone control rig? no eq is needed, but why do you ask? Are you thinking of the pro crossovers which include CD EQ's? Dr. Geddes waveguide is of his own design and profile, it's unique to him, and it contributes very little of the typical horn coloration's that such filters are designed to fix. His HOM foam plug is designed to take care of much of the rest of the artifacts that cause these artifacts. As I mentioned, I don't think these speakers sound anything like the typical horn loaded speakers we are used to hearing. Now, having said that, these speakers are designed to be listened off axis, and as such, the on axis response isn't as smooth as the power response. While I'm sure Dr. Geddes would prefer the best of both worlds, for 2-channel listening this should not be an issue, as you should have the speakers toed in quite aggressively, and thus won't be listening on-axis. It became a little bit of a problem for me because my center has to be listened to on-axis, but a small cross-over tweak took care of that. I'm glad you enjoyed my build thread. I'm not much of a creative writer, but I hoped it wasn't just another boring build thread. I tried to be thorough, show people what they might want to see on these speakers. I know there has been some interest in 3rd party confirmation of Dr. Geddes claims. I don't believe I have that ability, but I've done my best. Maybe my next thread should be "what not to do when building the Abbey"
Here is a 1/3 smoothed "quasi-anechoic" response I took in room, in position, at 2 meters, but with close mike of woofers and 120hz highpass filter. 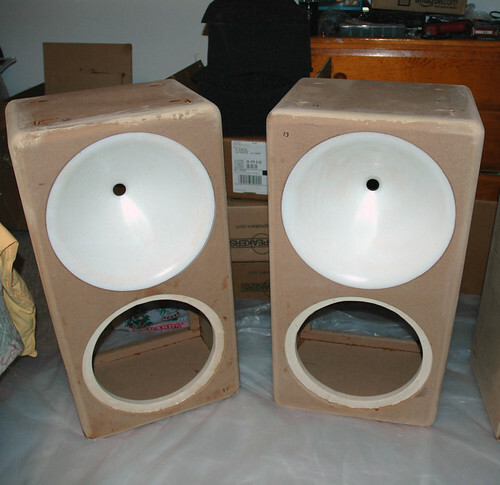 From reading your thread and others, it's clear that there're a lot factors required to build, prime, and paint these speakers; a clean, warm and well ventilated space, various masks, tools, skills - all things in short supply here. And the reason I asked about EQ is, I don't have one. Or tone controls. I'd rather not have to buy new/more gear to accommodate new speakers. Can you change the resolution to 1/6th or 1/12th? 1/3rd is not a high enough resolution. 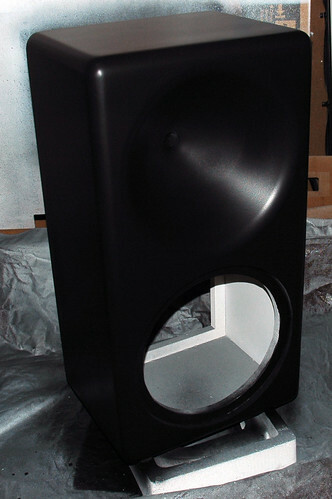 Dr. Geddes sells his speakers as fully built and tested items as well. The kit's save a little money, and give you something to do. I do and can give other measurements, but the argument for 1/3 is that it's roughly equal to how we hear. However, as I mentioned in the DIY forum post on this, part of the smoothing happens because any time you combine two graphs, the programs always add some smoothing to make the graph look right. In this case, I started with 1/6th smoothed graphs, combined them, and had 1/3 smoothed graphs. I'll post others later, but many of my early measurements suffered from some problems I had to work out (Of my own doing). Also know that due to weather, weight, and convenience, I won't be taking free field quasi-anechoic measurements for a while, so what I put up will be in room, but with some spatial averaging of the mic to reduce the effects of the room. Again, I want to warn that these are not anechoic measurements, they don't really even fit atb's requirements to get properly averaged quasi-anechoic, the speakers were measured at 2 meters in location. This measurement is with the mic in place, but the speaker turned through roughly a 60-90 degree range. this is an accelerometer attached to the side of the cabinet roughly in the middle between the brace and bottom. This shows the dampening and rigidity of the enclosure. I tried to window this to the same general scale that John Atkinson does in Stereophile so that people could compare in a way that they were used to seeing. I think those are excellent results by any measure. thats a rediculously good in-room measurement. Very nice! I am going to finish my review here. I try to be conservative and skeptical but tonight everything "clicked into place" with Earl's speakers. I moved them slightly and had them focus just slightly ahead of where I had them before and whoa, this is BY FAR the best sound I have heard. Equal to or better than Earl's room. I didn't think I would have ever said that small movements would "snap everything into focus", but it happened tonight! I have reached it tonight and who would have thunk it, very small movements. A taste of what I am listening to...Al Kooper doing "Am I wrong" and then Green Onions live,,,, super fantabulouus. Amazing and the VERY best I have heard in my room and I may listen all night. Just go hear them and buy them or just buy them. Science is so great. I am going to finish my review here. I try to be conservative and skeptical but tonight everything "clicked into place" with Earl's speakers. I moved them slightly and had them focus just slightly ahead of where I had them before and whoa, this is BY FAR the best sound I have heard. Equal to or better than Earl's room. I didn't think I would have ever said that small movements would "snap everything into focus, but it happened tonight! Wow! Randy, coming from you, that means a lot! Excellent! What kind of subs and crossover frequency does Dr. Geddes recommend? If I recall correctly, he recommends multiple inexpensive subs, each tuned, with different crossover points and phase settings. Dr. Geddes recommends multiple subwoofers in various locations around the room. The main speakers should be run full range. In the case of the Abbey's and Summa's they are full range enough that they act as additional low frequency sources. He has a setup that is somewhat similar to that of Harman's multi-sub approach, though location is somewhat less critical. Often his setup discussion goes something like this, and if he see's this, he can probably comment more completely, but: Place one sub in a corner, one sub on a side wall, and one sub higher up than the other two in another location away from those. Having subs of various types allows for a better room response. I think that it's a little misleading to say that Dr. Geddes recommends cheap subs. If you ask him, he often will say, he doesn't care what you use or if it's ported or sealed. He feels that expensive drivers with exotic motors are a waste of money, since multiple subs means that each can play more comfortably in it's range, and most of the response variation and distortions you might hear will be more room dominated that sub dominated. None the less, he uses Bandpass subwoofers of his own design in his system using B&C drivers, which are quite expensive. His recommended subwoofers really are not cheap, and are capable of quite a lot of output. I think what he is trying to tell people is, don't blow your sub budget on one or two really expensive subs, have at least 3, and you will have better bass. His recommendation for bandpass probably goes against the grain around here. Mark Seaton and John at AE also like bandpass though, they do things that no other alignment can do. Bandpass filters out much of the higher frequencies, and thus, much of the noise and distortions produced in that area. To minimize localization of the subs and maximize clean output, a 4th order bandpass is a great option. 6th order are what I believe Mark and John prefer, and for those who like EBS or low tuned ported, this would be more inline. However, having tried all of those routes, I really feel that a 4th order is the better option. As you can see from my own room measurements, my bass response goes plenty deep, well into the teens. In fact, my in room -10db point is something like 5hz. I do have a ported sub in the room, but it uses a damped port. Oh yes, and bandpass boxes are quite efficient as well. If designed correctly a bandpass can be every bit as efficient as a rear loaded horn. Nothing kills me more than when I see some proud new owner of 3 or 4 very expensive subwoofers all placed behind the front screen or spread along the front wall. The bass response would be so much better if they just moved those around the room a little, and there is real science behind that, it's not just conjecture. Do the kits allow for BSC adjustments? If I buy the kits, I would like to adjust the Step Compensation so that I can place them close too or in my wall. I have surrounds to build and they will be mounted on my wall, I would like to try out the Nathan design. Thanks for the great reviews. I knew that as I got these speakers get "out there" people would come to appreciate that science really works. If you are not familair with my philosophy, it is simply that the right scientific design IS the right design. Listening is fine, and what we all do in the end, but listening as a design tool is not going to get you beyond the status-quo. You won't get past average. There are lots of reasons for this, but the bottom line is the experinces described here testify that going the scientific road can yield a quantum leap in performance that is not likely to come from a lessor sophisticated approach. The sub discussion is mostly correct, but I'd like to add that there really isn't a sub "crossover". The mains are played full range and overlap the subs over a fairly large range. This is quite unique to my approach. Different subs are better than three or four identical ones, because the subs resonance is basically the same thing as a room mode. We go to great lengths to not have several coincident room modes and its a good idea not to have several subs of identical tunings. But the sub modes do tend to be well damped and this means that modal coincidence for them is not as critical as it is for room modes. The point made earlier, that its better to get more lower cost subs than fewer expensive ones, is the key point. They needn't be "cheap" but they needn't be expensive either. The key with multiple subs is setup. To get it right does take some setup capabilities, which always include measurements. The technique is outlined over at DIY. Its not hard, just takes some software and some time. The subs have to have LP frequency, gain and plus-minus phase capabilty individually. Then its just a metter of measureing and setting the parameters. As to the BSC compensation, no this is not "built in". The speakers are designed and setup for a more free field situation. In-wall is not out of the question, but it would be very situation specific and not something that I could do for the general case. Toe-in of the speakers with in-wall would require them to be in the corners. This then presents some problems with seperation and listening distance. The room would need to be quite narrow for this to work right. The Harper8 is almost ideal for the surrounds because of its far lower cost and its shallower profile. I designed these for my own surround situation. I also intend to build the Harper8's as surrounds at some point. I'll probably hold off for now and focus on those aspects which are of greater immediate concern. Such as getting my front arranged better, moving to an AT screen, etc. Dr. Geddes mentioned something over on the DIYAudio forum that I think is worth mentioning here. It's not a Gedlee speaker issue, more of a Geddes approach to room design, but he mentioned that more sealed rooms will not need as much bass energy as a more open room. Don't know about you guys, but I don't have a dedicated space, per say, and my Theater/living room is open to a hallway, kitchen, entry way, etc. 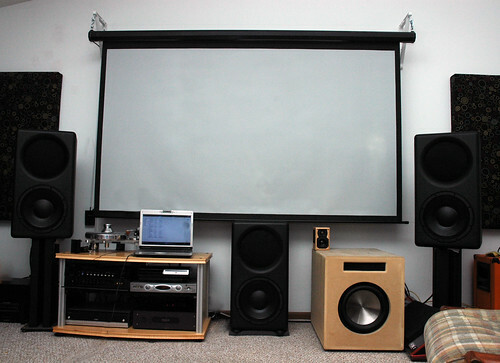 While the theater room is probably only 500 square feet, the area the bass can leak into is probably closer to 2000 square feet. In other words, I think maybe the size of the subwoofers will be somewhat room dictated as well. You might get away with 3 little 8" subs in a small sealed room. You might need 3 larger 18" subs though if the room is quite large and open. Of course, inline with his actual recommendation it should be a mix of sub types. My current subwoofer setup is somewhat temporary, as I plan to transition into all Bandpass designs in the future. However, I have one 12" TC 3000 which was customized for my specific purpose using a lower inductance setup and requiring a much larger enclosure due to lower Q. This sits in a 4-5 cubic foot box tuned to the low 20's, but then with cut pieces of the same basic filter foam material as Dr. Geddes used to damp the port. I cut enough pieces to layer it around 6" deep. That sub has a 1000 watt amp on it and is crossed over around 120hz 4th order, but with some roll off already occurring, due to the inductance of the motor, somewhat earlier. I have a 12" Dayton Reference HF subwoofer in a 2 cubic foot sealed box with 500 watt amp crossed over around 150hz or so. You can see with the TC sub is, Offset to the right front, and the Dayton is basically in a rear corner somewhat opposite. My last subwoofer is using 2 of the 7" mpyre drivers in isobaric mounting in a 4th order bandpass design. There is dampening in the port as well. The port is tuned to around 75hz but has the dampening added around 4" deep. There is also a 2" thick sheet of the stuff in the front chamber as well as some polyfill. Is The Harper8 available now? I've finished the prototype and the tooling for casting the waveguide is being made. I should be able to start making them in a week or two, but to get into the queue for any of the speakers you need to put down a deposit. So I'd be able to start making them well before I get the chance to make them. Earl, send me an email, because I want four. Order 6, and I can keep your off-site back-up spare pair here. I will take a pair. Email me with instructions on the deposit. quickest way to reach Dr. geddes is probably going to be emailing him. I believe instructions are also on his website, which is linked in his signature. When I did it I needed to deposit half the amount to get into the que.